A flow chart to aid in your pomaceous decision-making. Every fall, we at Slate are amazed anew by the vast number of apple varieties available at farmers’ markets, grocery stores, and (when we're feeling gullible) orchards. But when we encounter a new variety, we don’t always know what to do with it—and, conversely, when we have an express purpose in mind, we’re not always sure which variety to use. What’s the best kind of apple for applesauce? Are certain kinds easier to bob for than others? What variety should we keep on hand in case we run into any hungry-looking horses? How about if we just need a good projectile? 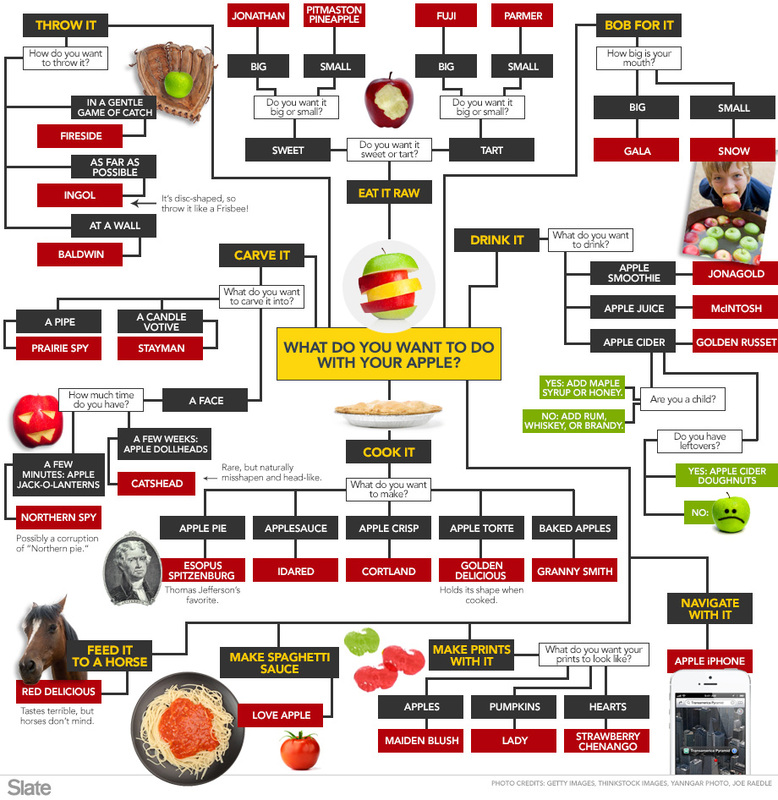 So we asked Andrew Mikolajski, gardening expert and author of The Illustrated World Encyclopedia of Apples, for some recommendations, which we put into the following handy flow chart. Print it out—or follow the links to recipes and crafts—and you’ll never choose the wrong apple variety again.